It’s hard to define what makes bourbon such a ubiquitous drink, equally relevant in a busy metropolitan bar and at home as you wind down for the day. The history and the connotations all play their part, but what stands out is a bold and recognizable taste full of depth and character. So much so that congress classified it as a ‘distinctive product of the United States’, labelling it a native spirit. It’s no wonder that bourbon is a multi-billion dollar industry with sales of crates numbered in the millions every year. The liquor is exported all over the world as far afield as Japan and the trend is on the upswing due to the resurgence of bar culture and the idea of bourbon as a mature drink for the discerning consumer. To give you an idea of how big the bourbon industry is, there are more aging barrels in Kentucky, where the majority of bourbon is made, than the state’s total population. In this article, we reveal our list of the best bourbons available on the market today. We have picked an option for all budgets, bearing in mind taste and overall quality. We also provide a short background on what bourbon truly is and what defines it as a liquor separate from other darker variants like whiskey. Whiskey and bourbon are very much one and the same, yet distinctly different. Not all whiskey is classified as bourbon. Bourbon is essentially a type of barrel-aged whiskey that adheres to strict production and distilling requirements regulated by the ATF that allow it to carry the name bourbon. Bourbon is exclusively made in the United States of America. If it’s made anywhere else, it simply isn’t bourbon. The ingredients used must include at least 51 percent corn and a host of other crops like barley, rye and wheat. A careful balance of these is what gives bourbon a distinctive taste and producers use different recipes to create subtle flavours and aromas. During distillation, bourbon can only have a maximum of 80 percent alcohol content and can only be mixed with water, or risk the wrath of enthusiasts everywhere. When the production process moves on to the barrelling stage, bourbon must be 62.5% alcohol at most. Only freshly crafted barrels made of charred white oak grown in the US are accepted for the aging process. This gives bourbon its characteristic reddish hue. Once bottled, bourbon has to have a minimum alcohol content of 40%. To retain a degree of authenticity synonymous with drinking bourbon, only water or ice can be added to the spirit when it hits the glass for consumption. Adding mixers or other additives is frowned upon. This is, however, for the purest and bourbon is used in cocktails and mixed drinks such as the old fashioned and derby julep. Labelling is regulated by myriad rules and specifications that focus on aging. For example, straight bourbon must be aged for at least two years to carry the name. Other rules focus on additives like coloring and the blended appellation. In other words, bourbon is a strictly all-American whiskey with a rich history that conjures up images of long drawn out, humid Kentucky days full of hard work rounded off with a rewarding glass of the land’s tipple of choice. As with any good thing, there are copycat producers the world over, but true bourbon can only be made in the United States. Bourbon is made in much the same way whiskey is and the method dates back over 300 hundred years. A mash is made with corn and other crops, then refined. Water and yeast are mixed in, then the mixture is left to ferment. The fermented mash is then boiled and distilled to create a colorless liquid known as white dog. It is then barreled and left to settle at which point bourbon takes on its distinctive colour and is imbued with flavors from the wood. Bourbon cannot be left barreled for too long because doing so runs the risk of spoiling the mix and taste. The liquor is then removed from the barrels and more water is added, then it goes through a filtering process and is once again boiled to regulate the alcohol content in line with the specifications outlined above. Certain distilleries forgo the filtering process for a stronger, fuller bourbon. The resulting liquid is bottled. Often a mixture of different bourbons from a variety of barrels are blended together to create distinctive flavors. In the lower price range it is still possible to find some excellent bourbons, such as the John E. Fitzgerald Larceny’s Very Special Small Batch. It is 92 proof/46% alcohol content and is available in a 750 mL bottle. We have here a wheated bourbon, whereby the liquor is made with malted barley rather than rye during the mash mixing process. The taste is well rounded, gentle and smooth. Larceny is ideal as an introduction to bourbon as it offers an accessible taste that is still flavorsome. This bourbon is particularly suited to simple drink mixes, though shines on the rocks or with a splash of water. There’s also a colorful history to the John E. Fitzgerald distillery. A treasury agent by the name of John E. Fitzgerald would visit bonded bourbon storage houses and pick out the very best barrels. The selected bourbons were then blended to make a wheated bourbon, which eventually became known as Larceny due to the agent’s larcenous activities. Though the veracity of this tale is questionable, it adds a magical allure that complements the liquor. Bourbon is all about rough and ready men, outlaws, moonshine and characters. You can’t help tasting it in Larceny’s Very Special Small Batch. For something a little more exotic at a low price, we point you in the direction of Jim Beam Devil’s Cut, which is 90 proof/45% alcohol content and sold in a 750 mL bottle. The uniqueness of this bourbon comes from the bottling process. In the barrel, bourbon reaches all the crevices and recesses, and is ‘trapped within the wood’ as Jim Beam’s distillers put it. These flavorsome concentrated pockets can be removed by ‘sweating’ the barrel, then returned to a 6-year aged normal Jim Beam bourbon. Sweating involves filling the barrel with water and agitating it to dislodge these bourbon remnants. Devil’s Cut has a beautiful darker tone as a consequence. The end product offered is a sweet, fruity and aromatic bourbon counterbalanced with hints of vanilla, and a bold, sustained oak taste. Devil’s Cut is not the most refined bourbon and it is best to enjoy it as a novel experience that provides a very varied selection of flavors for your taste buds. Next up, Four Roses Small Batch bourbon is a steal for the price. At 90 proof/45% alcohol content, this 750 mL bottle is made through a combination of four of Four Roses’ bourbons. The taste is full, yet balanced with hints of honey, sweet fruit, spices (due to the 35% rye content), floral notes and a sustained creme anglaise and oak aftertaste. It is smoother than the normal Four Roses batch and is generally lighter than a lot of other bottles. We recommend it as a summer whiskey to be sipped on the porch as the sun sets or with a good meal made on the grill. It won’t cut it in terms of warmth in the winter months though. We rate Small Batch as one of the top smooth bourbons available for this price. Worth a buy is the 90 proof/45% alcohol content W.L Weller 12 Year bourbon. Sold in a 750 mL bottle, it consists of the much more expensive Pappy Van Winkle's Family Reserve that hasn’t made the cut during the distillers’ taste test. The margin of this cut is infinitesimally small to guarantee the unquestionable quality of the Family Reserve. You are essentially getting an-ever-so slightly inferior, and younger, version of one of the most expensive and rare bourbons for a fraction of the cost. It is made with the same recipe and aged in the very same barrels at the Buffalo Trace distillery in Kentucky. The liquor itself is aged for 12 years, which is much longer than normal for a wheated bourbon, already making it stand out. The taste is full of complex tones, yet remains easy, dry and smooth. There are notes of toasted vanilla, almond and lanolin with a long, woody finish. You can taste a pleasant and constant sweetness through the layers of flavor. The nose is almost leathery with a general sweetness and caramel as well. This is one to savor and enjoy after a long day. An unexpected treat for the price, if you can find it. Its uniqueness means there are fewer and fewer bottles available for sale. We feel it is under priced and a clear bargain. For bourbon that even comes close, we are talking at least double the price. Sold in a stunning 750 mL decanter that makes the purchase worth it outright, the Willet Pot Still Reserve made our list as well. At 94 proof/47% alcohol content, this bourbon is much more than its container. The nose has been described as citrus with delicateness in its tints of flowers. The palate balances a graceful mix of sweetness with caramel and honey as well as a nice rounded spice aroma. The overall taste is full of woody character and is very smooth. Still Reserve goes down easily and it is very easy to knock back glasses. At such a low price, the decanter makes serving a pleasant treat usually associated with more expensive bourbons. Our last pick, and definitely not the least, in the budget category is the High West American Prairie Reserve. A 92 proof/46% alcohol content bourbon that is made in Salt Lake City, Utah rather than Kentucky as you would expect. High West is a young distillery and the first in the state since prohibition stopped. It is in the business of blending bourbons as a way to stay financially solvent while their own creations age, and what we have here is a perfect example of how to do this well. In addition, they donate a portion of income to a wildlife trust. The liquor is what called a straight-blend, a mix of mash recipes for straight bourbon. In this case, the mix is Four Roses and LDI bourbon, aged 10-years and 6-years respectively. Both contain rye after the primary corn ingredient, creating a rather sweet, fruit-infused, lighter bourbon when mixed into High West American Prairie Reserve bourbon. This definitely isn’t one for those who like a harsh bourbon. Instead, it’s a rather refined, complex drink with a bit of a bite, but nothing too overbearing that it would ward off the initiated. The nose reminds you of a selection of fruits, leather and there are whiffs of anise and spices. The signature caramel smell that is associated with bourbon soon bubbles to the surface and is very pleasant. The palate is almost pepper-like and you can definitely sense the spices and naturalness for an appealing balance. We get cherry, strawberry and a rounded grain feel that merges all these flavors together well. The aftertaste is full of flavor linked to the aromas listed above as well as a defined oak taste mixed with barley and spices for a savory sensation. We rated this bourbon not only because of the taste, but also because it comes from one of the smaller distillers. The best bourbon is often found by going away from major producers and off the beaten track. For a couple more dollars than the bourbons listed above, we find that the Bulleit 10 Year Old bourbon is worth your time. Here, we have 91.2 proof/45.6% alcohol content bourbon that has been aged for 10 years, served in a 750 mL bottle. Usually, Bulleit stays in the barrel for no more than 6-years or so. In this case, the very same lauded bourbon has been left to sit for an extra few years to create a rather different, more inquiring tasting experience. The nose has a wonderful fragrance that mixes the expected caramel with scintillating hints of toffee, rye and a variety of fruits, including citrus hues. The taste is most marked by a strong wood character and a great deal of rye as well as leather and vanilla. This creates an intense, complex, yet smooth flavour with less harshness that normal Bulleit’s normal offerings. The aftertaste is smoky and full of spice. The Bulleit 10 Year Old is ideal for sipping throughout the evening and never seems to get boring or predictable. Running with the theme of longer aging, we present the 750 mL Widow Jane 10 Year at 91 proof/45.5% alcohol content. Given the very few ingredients used to make bourbon, the quality of the water used is a crucial factor in determining taste and character. Made in Brooklyn, rather than Kentucky, the Widow Jane uses particularly mineral-rich water from the Widow Jane limestone quarry in upstate New York, hence the name. The nose is a little surprising at first and we recommend letting it acclimatize before enjoying it. Once you’ve done so, the aroma is very pleasant, made of vanilla, corn, honey and citrus. The taste is well rounded and geared towards drinkability with an array of flavors that complement one another rather than stand out as you drink. These include deep dark fruit, caramel, vanilla, flowers, spices and an oaky feel. The finish is earthy and full of wood, citrus and more flowers as well as a pleasing dyrness. There is something quite unique about the taste that is hard to put into words and we attribute it to the water used. Texture wise, Widow Jane 10 Year is almost syrupy smooth without being overbearing. The label also adds a certain appeal with its no thrills white background and handwritten numerals detailing the exact origins of the bourbon. It reminded us of something that may have done the rounds in simpler times. The name itself conjures up images of the good old pre-prohibition days of bourbon making and the Colonel was one of the main actors. As a tributary homage, we have here a 125 proof/64.5% alcohol content bourbon that mimics methods of old whereby bourbon was extracted straight from the barrel then bottled without being filtered. This 7-year aged low rye bourbon packs a punch, yet retains subtleties that make it much more than an assault on your sense. The nose is surprisingly docile given the strength and acts as a kind of prelude to how softened the overall experience is. The aromas that waft out are orange, corn and caramel. The taste is vivid with strength, but also smooth enough to be enjoyed quite readily. We have hints of dark fruit, caramel, coffee, and cocoa. A strong oak finish is rounded off with toffee and spices. You definitely feel its effects and getting there is an all-enjoyable journey full of complexity. We also liked the 750 mL bottle for its understated elegance and long design. A delicious bourbon that is surprisingly light and one to enjoy in moderation due to the unwittingly high alcohol content. We like distillers that concentrate on doing one thing really well, fine tuning it to perfection to create a unique, yet consistently high quality bourbon. Here, we have Booker’s Bourbon. We can’t give you a specific proof number because it really depends on the specific bottle’s year. The way it works is that each year, a number of acclaimed bourbon critics are gathered together and sift through a selection of Jim Beam’s best barrels, selecting the ones they rate the most. These are then blended together to create Booker’s Bourbon. The name is attributed to Jim Beam’s grandson, a master distiller who would choose barrels to gift to friends. His pickings became very popular and the distillery decided to commercialize them to create the Booker’s Bourbon. The barrel proof mix is bottled directly from the barrels with no filtering or extra water. Generally, it isn’t for the fainthearted and packs a punch with a heavily smoke filled taste. That’s not to say it doesn’t retain complexity with an often nutty nose that signals the strength of what is coming. In terms of taste, expect sweetness, woodiness and leathers. As you can imagine, the finish lasts a while and has some floral tones as well as wood and vanilla. The taste can differ somewhat depending on the year’s batch. We highly recommend the 2017 Tommy’s Batch and the 2015 Noe Secret in particular. Both are unique, strong bourbons, full of flavor, though not for the uninitiated and probably best served with some water to stay on the safe side. The George T. Stagg is a mainstay with many bourbon enthusiast and with good reason. At 138.2 proof/69.1% alcohol content, it is a strong barrel proof bourbon, hearty, intense and bold. It’s been in barrels for up to 15 years and then bottled without filtration or water, hence the high proof number. With such old bourbon, there’s a risk that evaporation leaves barrels with only a small pool of liquid and this is what contributes to the uniqueness of this bourbon. The nose, though definitely full of ethanol, has enough complexity in the aromas for an interesting experience. There’s spices, wood, fruits and caramel. Taste is mainly oaky with a sweetness that complements it well coupled with spice, chocolate and leather, even molasses and coffee. It’s full-on and intense, yet pleasant. You will enjoy picking out the flavors as you enjoy the initial hit. The finish is long as expected with such a high alcohol content and we tasted vanilla, wood, herbs like spearmint, coffee and fruits. This is a bourbon for those who like a hearty drink in the depths of winter, enjoyed after shovelling snow off the front path. Add a splash of water and enjoy the warmth that coats your mouth in an almost oil-like film. It does burn and the sensation lasts throughout the drinking process so make sure to share this one with those in the know. We recommend letting it air for a while to let the extra flavors come to the surface. This bourbon doesn’t need an introduction. Pappy Van Winkle’s Family Reserve 20 Year is arguably among the best bourbons in the world and has a rich heritage that precedes it. The 750 mL bottle comes in a 90.4 proof/45.2% alcohol content and is a mythical liquid that has a price tag numbered in the thousand of dollars to match. In certain bars, a small glass can cost as much as a couple of bottles of the cheaper stuff. The only real problem is finding a bottle for yourself and with this comes incredible markups as opportunists jump at the chance to buy small batches to sell on for profit. Van Winkle is made primarily with wheat and barley as well as the normal amount of corn. The absence of rye is arguably part of what makes such a quality taste. It oozes hints of raisins, caramel, creme anglaise and a full oaky feel. The taste also has elements of fruit, honey and vanilla with a truly lasting finish that envelopes your mouth and taste buds. The texture is almost buttery, yet well-rounded and filling. Pappy is a strong bourbon for the serious bourbon connoisseur. We recommend drinking it straight, with no water and definitely not in a cocktail or mixed drink, which would be sacrilege. Enjoy it slowly and thoughtfully, grasping at every lingering aroma for the best experience. Another bourbon priced in the thousands of pounds, is the world famous A.H. Hirsch Reserve 1974. This one is known as the best bourbon in the world. It’s 91.6 proof/45.8% alcohol content and is made from 16-year matured bourbon. There’s a rich history behind the Reserve and one the most fascinating parts is that it originates from a distillery that no longer exists. As the name suggests it was distilled in 1974 at the Michter distillery. Michter went out of business and the barrels were bought by Adolph Hirsch, who bottled them and sold them under his own name. The limited number of bottles are responsible for the high price, but it is the well-balanced, uniquely dry, memorable, and incredible taste that truly warrant the Reserve’s reputation. There’s a whole process to drinking expensive bourbon and one of the most important is to let the liquid sit in the glass for a while before engaging with it. Once this is done, the nose is full of nuances with orange, spices, honey, fruits, nuts and even pepper. The result is sweet, musky and unbelievably enticing. The palate is defined by texture. The bourbon almost evaporates as it hits the tongue and creates a smooth taste full of delicacy and is something quite unique. Once it settles, you taste wood, fruit, grains, nuts, cocoa, coffee and it isn’t too sweet or dense. The flavors are definitely apparent, but they are very well-balanced with a perfect measure of smokiness to round them off. The finish is sustained, yet delicate. The mouth remains awash with spices, wood and fruits. Our description is a feeble attempt at describing this unique bourbon and all we can really do it recommend that you try it yourself. That is, if you can get your hands on a bottle. The experience is so explosive and surprising, we can’t help thinking that the hefty price tag is justifiable. The normal aging process creates a defined and predictable bourbon with centuries of distilling prowess in every mouthful, but for those that want something a little different, we recommend Jefferson’s Ocean: Aged at Sea. We have a 6 to 8-year aged whiskey at 90 proof/45% alcohol content that at first glimpse seems nothing more than a marketing ploy. Once you have a taste, you realize the error of your ways, here’s why. Jefferson selected a number of quality barrels and loaded them onto a ship, which travelled around the world to a number of ports. During the journey, the bourbon was swished and splashed in unison with the tides and the cresting waves of the seven seas. As it journeyed forward, the bourbon matured faster than it possibly could on solid ground as it collided continuously with the oak of the barrels. The result is a truly tasty and thoroughly deep bourbon with more than a fancy back story to prop it up. Much like the steady back and forth of the oceans, this bourbon is full of shifting character throughout the tasting experience. The nose is full of spices and the usual caramel with hints of cherries, oak and vanilla. The scent is defined, full and primarily sugary to the nose. Once in the mouth, there is an onslaught of fruits, spices and caramel as whiffs of wood and vanilla push through occasionally. Surprisingly, or maybe not given the process, there is definite, yet subtle saltiness to the mix. Possibly to do with the sea air, we reckon. The finish is full of the flavors listed above with an emphasis on a slightly hard to define tart taste that lingers nicely. Overall, this is a strong bourbon with some heat though entirely drinkable. The character is all there and is what makes it such a treat to drink. Sit down, take a sip and ride that wave. 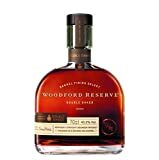 Another bourbon with a peculiar production process is the 375 mL Woodford Reserve Double Oaked. At 90.4 proof/45.2% alcohol content it is double barrelled, as the name suggests. This means that 8-year matured Woodford Reserve Distiller’s Select bourbon is moved to a fresh second barrel that is more charred than the first for added flavor. Until recently, this was rather uncommon for bourbon and the process creates an interesting mix of sweetness, spices, corn and wood. The nose is full of sweetness and woodiness with vanillas, corn and a lingering syruppy scent. The overall sweet aromas can be attributed to the second barrel and create quite a complex smell that is rather enticing. The taste focuses on oak and sweetness as you would expect from the nose, with hues of fruit and caramel. It is clearly deeper than normal Woodford Reserve and has added richness as well. The finish is not rough per se, but has some bite to it that feels more like an appropriate ending than a lingering burn. We sensed leather, rye, fruits and then woodiness and spices for a sustained period afterwards. Though complex, it is not overwhelming and can be tackled even by novice bourbon drinkers as well as more versed counterparts. This multitude of facets and its versatility are what makes the Double Oaked stand out for us. Double Oaked is only sold at the distillery so make a trip of it and have a look around while you’re there. Today, any product that does its part for sustainability automatically wins brownie points and the bourbon world isn’t immune to the trend. The standout choice for sustainability, and a unique aging process, is the Hillrock Estate Solera Aged Bourbon. At 92.6/46.3% alcohol content, this bourbon understands that maturation is a crucial step in making a great product. In addition, the mash is made of ingredients grown on land adjacent to the distillery. The whole process is managed and made in the one same place saving on transport and shipping costs for maximum sustainability. The reuse of barrels also means they don’t waste these or ship them abroad as many other distilleries do. Hillrock are craft distillers who are the first to use the European solera aging process. This employs an old technique whereby a selection of bourbon barrels are selected and small amounts of liquid are extracted at regular intervals and fresh bourbon reinjected. The barrels stay continuously full by being topped up like this and as the different bourbons swell and meld together, they age faster creating complex flavors. They are mixing old and new bourbon, then shifting them to sherry barrels to even the taste out and add different flavors. The result is a bourbon that is more or less 6-year aged. The nose is rye rich due to its heavy presence in the mash mixture. There are also fruit, flowers, and an overall sweet aroma. The taste is full and balanced swaying towards the lighter side of things. It may seem uninspiring and underwhelming at first, but when the flavors come through the taste transforms into a torrent of richness. You taste the sherry and other fruits, as well as the usual caramel and vanilla. There’s something quite earthy about it although there is a marked absence of strong wood, which isn’t a bad thing. The finish of the Solera Aged bourbon is clean and lacks any kind of roughness. The remaining taste is sweet with a previously anticipated oaky feel that finally rears its head. We like this bourbon for the unique taste and subtlety of flavors. Given the relative youth of the distillery, we foresee an even more pronounced rise in quality as the full effects of sustained solera aging show results. Time will allow the bourbon to settle into a more uniform and distinctive character. There’s a nostalgic quality to drinking bourbon that is made according to recipes of old and the Old Ripy fits that bill exactly. The 350 mL bottle is 104 proof/52% alcohol proof and incorporates 8-year aged straight bourbon with a selection of 12-year matured whiskies for added flavor layers. The recipe dates back to pre-prohibition times and you can taste it with a ‘chewier’ feel as the distiller describes it. The nose has fruits like raisins and apple, as well as vanilla, toasted oak, caramel and a selection of spices. The palate is full of spice and a significant oaky veneer. There’s also grains, citrus and fruit. The finish is drawn out, very fruity and there are hints of grain with a pleasant oaky harshness that lingers nicely. Overall, the Old Ripy is rich and well-rounded, though not overbearing in its strength. To be enjoyed occasionally as a nostalgic treat harking back to better times. Jefferson aren’t a distillery. Instead the company are blending masters extraordinaire who meticulously select the best bourbons from some of the best distilleries around, then blend them together to create a truly masterful product. A lot of what they do is experimenting to find the right balance and their unique tasting abilities play a huge part in creating a novel, pure, and tasteful bourbon. In this case, it is 94 proof/47% alcohol content that mixes bottles that are 21-years aged and older. Finding such old bourbon is a task in itself, blending them into something cohesive is a feat. We have a full and woody taste that exudes something indescribable from the past. The nose is full of spice, leathers, fruit and oak. The taste hits with vanilla and honey followed by an array of spices and finally a strong woodiness. The finish is rather gentle with a clear emphasis on the woods due to how long the liquor was in the barrels. Limited stock is the name of the game with Jefferson’s Presidential Select 21 Year. Grab one if you can before it’s too late. If you like it, hunt down bottles from previous years, notably the 18 year, which tastes even better than the 21 year.